History behind Son Bhandar cave of Rajgir. This is renowned son bhandar caves situated at Rajgir,Nalanda in Bihar state. Son bhandar group of caves has two caves known as eastern and western cave. 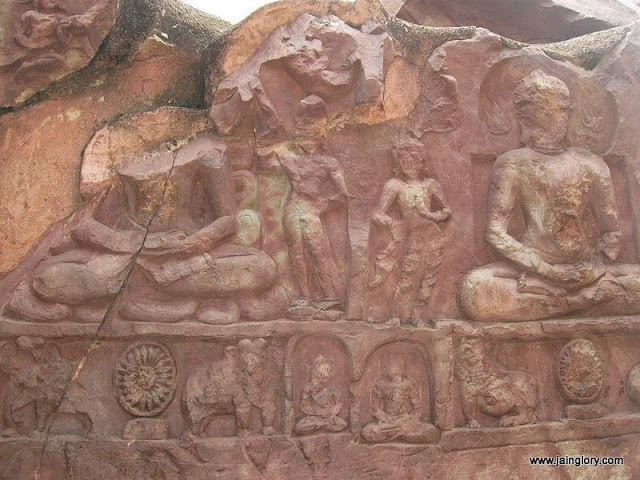 Son bhandar caves are concerned with Jainism and considered to belong to 3-4 century AD. These caves were first inspected by cunninghum and he concluded to have analogy with saptparni caves of Buddhism creed.After cunninghum several scholars visited this place and some had opinion to concern with Buddhism. After some time all Buddhism connections were refused because of an inscription found on the southern wall of a cave. According to this inscription these caves were built by inspiration of a Jain muni Vair for Jain ascetics. Sculptures of Teerthankaras were also carved in these caves. From architectural aspect; these caves are analogous to Nagarjuni cave and Barbar caves of Mauryan era. Therefore it can be concluded that construction time should not be much differ from above mentioned caves. These caves should be related to digambar sect of Jainism as Xuanzang wrote in his book about Vaibhar hill of rajgir that the place was occupied by Digambar Jaina monks for meditation purpose. After some centuries these caves were converted by Hindus as Lord Vishnu sculpture was also found from mound of a cave.